Why our hand bays are the best! It's only $2.00 to start washing! The first $2.00 gives you four minutes of wash time and then it's only 25 cents for every 30 seconds there after. We have HOT WATER! We're the only facility in town with hot water. The hot water makes it easier to get the nasty bugs, dirt and that tough grime off your vehicle. 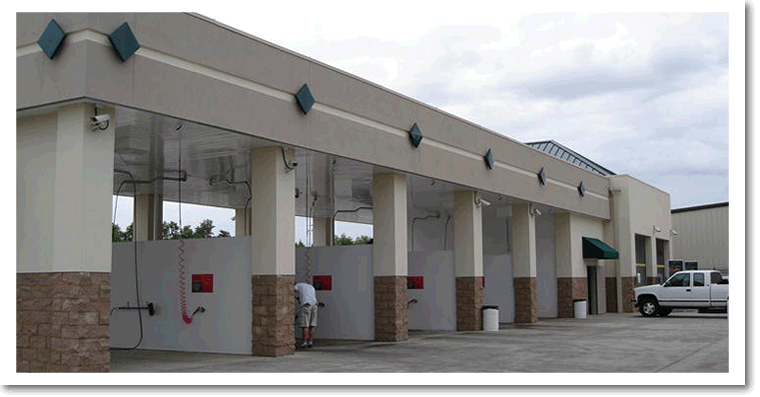 We a have large selection of detergents and conditioners offered in our hand bays. You really get your "bang for your buck" in our hand bays because the heated water cost the same for the waxes, soaps and the low mineral, spot-free water. All the selections in the hand bays are the same cost - no extra! We are motorhome and trailer friendly. Our bay #5 is equipped with dual wands, making it easier for washing those tall vehicles and not having to put up a fight to get the hose around the top of the vehicle's tall roof. Our hand bays are well lit so you can see how shiny your car is after you've given it a bath. The nice bright lights are great for those summer evening washes, when the air is cooler and the sun is down. We accept credit cards (debit or credit) in our hand bays. We accept cash, quarters, tokens and Express Keys as well. We have extra long bristle, all natural hog hair brushes in our hand bays. The hog hair brushes are softer and more gentle than the typical synthetic brushes. Our hand bays are roomy. There is plenty of space in our hand bays to fit dually pick up trucks, motorhomes, trailers and more. Stop – Select off when finished cleaning vehicle or when necessary. Return want to holder. Time continues to run in the off position. Tire Cleaner – No car is clean until the wheels are clean, bright and shiny. Great on white walls and any wheel surface this bright green tire and wheel cleaner will put the finishing touch on your clean and shiny vehicle powering through brake dust and grime. Apply wheel and tire cleaner, low pressure, to each wheel and tire. Clean with high-pressure rinse from tire. Do not apply wheel and tire cleaner to paint. Pre-Soak – Clean your vehicle and take a trip to the tropics with our Tropical Fruit scented purple presoak. Prep your vehicles surface to ensure a great cleaning with this premium detergent. It’s tough on bugs and road grime, especially on those hard to scrub, high bug and dirt infested areas such as the front bumper and lower side panels of your vehicle. The pre-soak will help loosen those areas and make cleaning easier. Apply pre-soak, low pressure, to entire vehicle from bottom up. High Pressure Soap – Blast away dirt and grime with this high-pressure detergent. You’ll smell the cleaning power as it attacks the toughest road soil. Apply soap to entire vehicle from bottom up. Foaming Brush – Provide your vehicle an ultra cleaning with this sensory detergent that loosens dirt and road grime while providing you a pleasant cherry scent and vivid colors. Our foam bath detergent is tough on dirt but gentle to your car’s surface. Wash the brush prior to using. Scrub entire vehicle. Rinse with high-pressure rinse. High Pressure Rinse – Rinse entire vehicle from top down. Triple Foam Conditioner – This colorful application conditions your vehicle giving your paint a drink of moisture while creating a deeper hue and glossy look to the surface. You’ll love the pleasing grape fragrance and superior results. Apply triple foam conditioner to the entire vehicle. Then, rinse with high-pressure rinse. Clear Coat Protectant – Provide your car the shine it deserves with this premium sealant and surface protectant. Apply to the vehicle’s surface and you will immediately notice the superior beading giving you ease in drying your vehicle and giving your vehicle surface protection from harsh environmental elements with a brilliant shine. Apply clear coat protectant, high pressure, to entire vehicle. Finish with final, spot free rinse. Spot Free Rinse – Avoid water spotting and make drying your car easier with this low mineral rinse water. Apply rinse water, low pressure, spot free to entire vehicle.